While most people see football analytics as up and coming, one man has been using it for a long time. Bob Stoll, the man behind Dr. Bob Sports, has used football numbers for over twenty years to provide winning football picks against the Vegas line. In a business in which only one number matters, he beats the line 56% of the time over the last 13 years of college football. Since a winning percentage greater than 52.4% is profitable, this is a significant edge for bettors who subscribe to his service. Let’s take a look at how he does it. Luckily, Dr. Bob is quite open about his methods. His website has an extensive set of essays about his techniques. First, we’ll focus on his football analytics, or what he calls his math model. He begins by warning about using a regression model on football statistics to predict the future. The problem is that some statistics do not predict the future because their early season values don’t strongly correlate with late season values. This weak correlation implies that randomness plays a large role in these numbers, not the skill of the team. Dr. Bob claims that fumbles are 90% random. A model that uses turnovers will accurately describe what has happened already but doesn’t project well into the future. In a similar fashion, Bill Barnwell of Grantland found that turnovers forced by a defense are 98% random. Hence, teams that enjoy a large turnover margin are getting lucky and shouldn’t expect this luck to continue. So what statistics does Dr. Bob use in this model? He mentions rush yards per carry. It’s remarkable how simple division can make a world of difference in the meaning of numbers. Rush yards per game is a silly statistic since a triple option team like Georgia Tech runs the ball almost every down while a spread offense team like Houston barely runs the ball. It’s much more meaningful to divide those total yards by the number of rush attempts. Comparing the pass yards per attempt for an offense against the pass yards allowed per attempt by an opposing defense allows Dr. Bob to analyze how two teams match up. These football specific numbers goes into the weekly analysis he provides to his subscribers. Moreover, Dr. Bob discusses using compensated statistics that account for strength of schedule instead of the raw numbers. If Oregon and Rutgers rush for 3.6 and 4.0 yards per carry respectively, one might think that Rutgers has the better rushing offense. However, Rutgers put up those numbers against defenses that gave up 4.2 yards per carry. Oregon earned those yards against defenses that allowed 3.4 yards per carry. Relatively, Oregon rushed for more yards per attempt than the opposing defenses allowed, while Rutgers didn’t. Dr. Bob’s research over tens of thousands of games shows that Oregon will outrush Rutgers against an average defense. Dr. Bob doesn’t stop at compensated yards per attempt. The most impressive aspect of his analysis is accounting for injuries. In his essay on his math model, he speaks vaguely about evaluating for defensive injuries. In a panel at the 2012 Sloan Sports Analytics Conferences, he gave us some more juicy information. His research shows that cornerbacks are more important than linebackers. He cited some examples from the 2011 NFL season in which some defenses performed just fine without a star linebacker but just crumbled without an average cornerback. For example, the Steelers played well without James Harrison, while the 49ers were just as good in 3 games without Patrick Willis. These teams are 29-57-2 (33.7%) against the spread in this game. The math shows that this trend is statistically significant. However, that’s not enough, since there’s a 5% probability that the trend exists due to pure randomness. Dr. Bob only uses trends that make sense. In the above example, the team is ripe for a letdown after winning two games. Visiting a non-division team makes that letdown even more likely. For further reading on situational trends, check out Chad Millman’s article on the Buckeye Database. Having an edge over the Vegas books is nice, but it does not guarantee making a profit from gambling. Bankroll management is crucial. Even with a 56% winning percentage, there will be losing streaks. Putting down too much money on games can wipe out a bankroll. In the extreme example, suppose someone puts all of his bankroll on one game. Even with a 60% win rate, there’s a 40% chance of going broke. To properly manage a bankroll, one must understand the Kelly criteria. It’s a mathematical formula that relates one’s edge in a game to a bankroll fraction that maximizes long term growth. No one can claim to use mathematical principles for investing without understanding this idea. This applies to quantitative hedge funds as well as the sports market. Dr. Bob’s essays on the Kelly criteria are the most complete discussion on the web. For further reading, we highly recommend William Poundstone’s book Fortune’s Formula. Dr. Bob uses the Kelly criteria to suggest betting 1.5% of the bankroll per star on his football picks. That’s the fraction that maximizes the rate of growth of the bankroll. To get a perspective on the potential long term growth, Dr. Bob claims that $10,000 would turn into $349,112 over 10 years. He considers sports an investment, not gambling. But what if he’s just getting lucky? 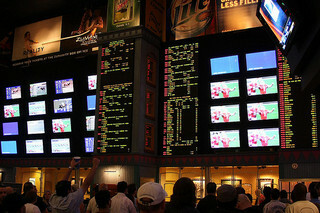 Dr. Bob’s college football gambling picks win 56% of the time, going 575-453 over the last 13 years. But maybe it’s just luck. When estimating this win percentage, there’s an element of randomness. The real win percentage might be 57.3%, or 52.1%. Using a little probability, we can estimate the distribution of this win rate given the number of games in Dr. Bob’s college football sample. The width of this distribution decreases with more games. With this analysis, there’s only a 1% chance that Dr. Bob’s true win rate in college football is less than 52.4%. Those are some good odds. To put this in perspective, a result from a medical study has a 5% chance of being wrong. This results from the uncertainty in picking a small number of patients to participate in the study. The odds that Dr. Bob is not profitable is significantly lower than the odds your doctor is providing treatment based on a bogus study. Dr. Bob is the one guy in the world I wouldn’t invite into my college football pool. To see the pricing of his subscription services, click here.